From the editor: Michael Bugeja is an award-winning professor at the Greenlee School of Journalism and Communication at Iowa State University. He’s an early critic of digital technology, recognizing that the mediation of interpersonal relationships via screens would pose societal and ethical problems. He’s been examining this phenomenon for years, including with his 2005 book Interpersonal Divide: The Search for Community in a Technological Age, 2017’s update Interpersonal Divide in the Age of the Machine, and an ongoing blog at Interpersonal-Divde.org that ties current events to briefs on the same themes. We’re grateful that Michael will occasionally share some of his topical posts with us here at The Technoskeptic, where we may include some extra contextual information for our readers. Give me a break. Or better still, Facebook give us a break. The device comes with all manner of disclaimers about loss of privacy. Only that language is couched in what YOU can do to protect your privacy, if you use it. You can disable the camera (nobody will forget to do that, of course); the camera’s AI programming doesn’t use facial recognition (nobody will recognize you in your own kitchen using your contact data), the device doesn’t share your conversations (although it integrates with Alexa, which does), and all bets are off as soon as you say, “Hey, Portal” (cool; but you’ll have to delete voice history). If you think this review is negative, you haven’t read the technology blogs. The devices come in two sizes: Portal (10-inch screen, $199) and Portal Plus (15.6-inch screen, $349) with enhanced audio with video rotation to track just what you are up to in your physical environs and adjust accordingly. 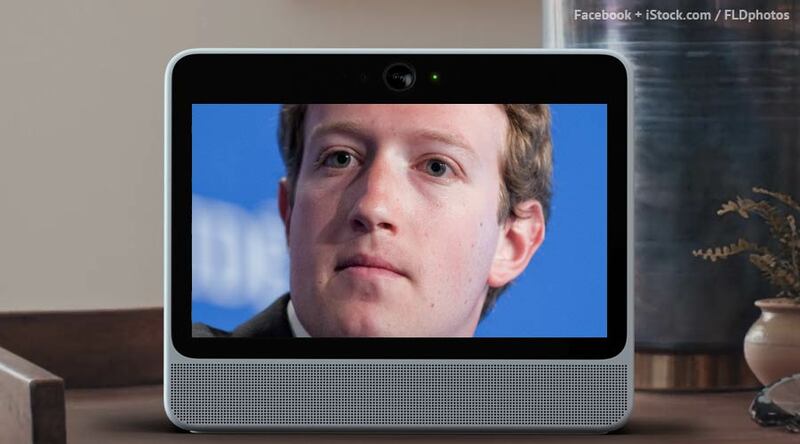 Unfortunately, this new Portal device was introduced during Facebook’s latest security breach affecting between 30-50 million users, with millions reportedly having their contact information stolen, along with data about their gender, relationships and location. The company has published a website where users can check if their accounts were affected by the security breach. To see if you are affected by the latest breach, visit the URL in the sidebar.